Steve Becker’s passion is training young athletes to excel in high school, college, and professional sports. 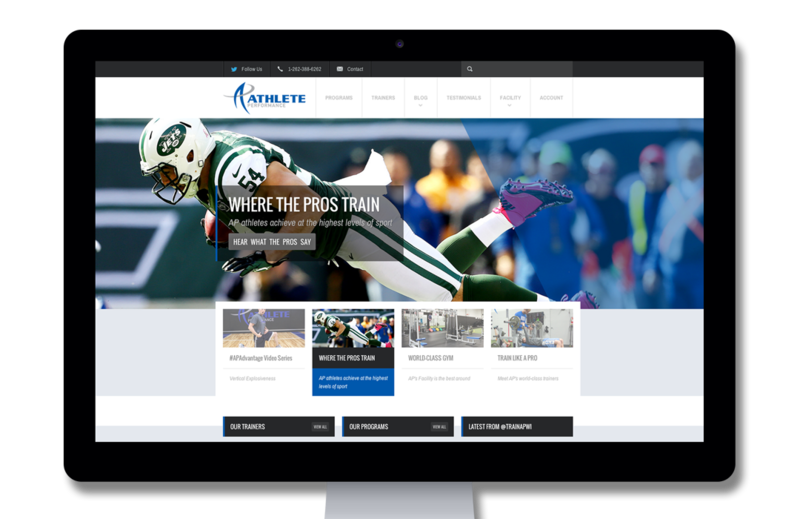 So when he started Athlete Performance, he recognized the need for a youthful and fresh website that communicates the kinetic energy of his business. Envy Creative was called in to help realize Steve’s vision with a visually-striking and bold web experience that would grab the attention of all visitors. The team at Envy recognized that the design needed to cater to two different audiences: the young athletes who want to up their game, and their parents who would be investing in their child’s future. In the web world today, you need to make an immediate and powerful impression as quickly as possible. For Athlete Performance, that meant drawing attention to their skilled trainers and world-class training facility right away. Envy Creative designed a homepage experience that communicates the professionalism that Steve and his team exudes, while also introducing new visitors to the staff and their most popular training programs. From there, Envy’s photographer, Justin Ferrari, handled profiling the facility and trainers for a bold visual opening salvo. Envy Creative wanted to design a site that wasn’t just a static page with bios and hours of operation, but instead served as surrogate of the experience at Athlete Performance. With any brick-and-mortar client, the design and development team at Envy strived to extend the “AP Advantage” from their facility to the web. The result is a user-friendly site that feels just like walking in for your first training session at the Athlete Performance facility – welcoming, professional, and exciting. We live the web. We have a knack for crafting experiences that really connect with users. You have an awesome business, a unique product or service, and a passion to meet your customers’ demands. We should probably put those two things together and take over the world.